Betapa banyak lukisan tiruan Mona Lisa, tetapi orang ramai masih lagi berusaha nak melihat lukisan Mona Lisa yang asli. Nowadays, as we can see, everyone talk about oil and gas. Ok let us explore it. The Malaysian oil firm Petronas has won Ethiopia's ambitious Calub and Hilala gas field development tender, it was learned on Saturday. After evaluating the proposal presented by Petronas, the Ministry of Mines and Energy selected it, said a government official, who declined to be named. The official said the ministry and Petronas will sign a development agreement to enable the firm to develop the gas fields that lie on 285 sq km of land. The gas reserve was discovered in 1972 by an American oil company, Tennaco. There are eight gas production wells in Calub. Petronas, Gail India Ltd and Dinder of Sudan participated in the tender put up by the ministry. Last March, the ministry invited companies to present expressions of interest on developing the natural gas reserve in the Ogaden basin, found in Calub and Hilala areas, some 1,200 southeast of Addis Ababa. Nineteen international and local companies submitted letters of interest to the ministry. After evaluating the profiles of the companies, the ministry short-listed seven companies. Of the seven companies, only three submitted their proposals within the deadline scheduled for July 10. Petronas has a plan to build a gas refinery plant at Calub and to construct a gas pipeline all the way to Djibouti that would enable it to export petroleum products. Studies indicate that LPG, petrol, diesel, jet fuel and kerosene can be produced from the gas reserve. Petronas has proposed to invest up to 1.9 billion U.S. dollars. The company also plans to drill exploration wells in the vicinity of Calub and Hilala. CS Mutiara Petroleum Sdn Bhd, a 50:50 joint venture company between PETRONAS Carigali Sdn Bhd and Shell Exploration and Production Malaysia BV has made another gas discovery in Block PM302 off the northeast coast of Peninsular Malaysia. The Bunga Dahlia Channel-1 exploration well, located in a water depth of 67 metres, was spudded on 18 February 2006. The well was drilled to a total depth of 2,260 metres and encountered multiple gas zones. Further technical evaluation is required to determine the volumes of the discovery. With this latest discovery in Block PM302, CS Mutiara has recorded six consecutive exploration successes including Bunga Kamelia, Bunga Zetung, Bunga Anggerik, Bumi South and Bunga Kesumba in the adjoining Block PM301. The company is currently embarking on technical studies to assess the development options for the gas discoveries in both blocks. CS Mutiara was formed in July 2001 and operates Blocks PM301 and PM302, both located off the northeast coast of Peninsular Malaysia. Petroleum exploration and exploitation in Malaysia began over a century ago, with production of less than 100 barrels apa day. Today, Malaysia's petroleum industry has grown into a multi-billion dollar business, producing 600,000 barrels (bpd) of oil and 4.7 billion cubic feet of gas apa day. Prospects for Malaysia's oil and gas industry remain bright and the sector should experience healthy growth rates. During the pasti five years, some US$6.6 billion have been spent on exploration and production. Sixty percent of MalaysiaÃ¢â‚¬â„¢s crude reserves remain undeveloped. According to the government's Eighth Malaysia Plan, US$16.2 billion are supposed to to be invested by the petroleum industry during 2001-2005. Of this, Petronas (National Petroleum Corporation) and its production sharing contractors are expected to spend US$10.9 billion (67.5 percent) on exploration, development and production. Petronas has been partnering with several major players (such as ExxonMobil and Shell) over the last 20 years both in Malaysia and abroad. Fourteen multinational oil companies have operations in Malaysia. Exploration is becoming more costly and requiring advanced technology as new sites are further offshore in ultra-deep waters. Nevertheless, Petronas--a global player with world-class capabilities--is well positioned to take on the challenge. In an effort to coax oil and gas companies to explore deeper waters, Malalysia has developed a new set of Production Sharing contract (PSC) terms for deepwater ventures. Since deepwater exploration and exploitation will require advanced technology equipment, it should favor U.S. products because of their state-of-the-art technology. Petronas was incorporated in 1974 as MalaysiaÃ¢â‚¬â„¢s national petroleum corporation. Vested with the entire ownership of the nationÃ¢â‚¬â„¢s oil and gas resources under the Petroleum Development Act 1974, Petronas has now become a fully-integrated, international petroleum corporation participating in all sectors of the industry.. In addition to ensuring the equitable exploitation of MalaysiaÃ¢â‚¬â„¢s oil and gas reserves, Petronas has contributed significantly in adding value to these resources and assuring a stable supply of fuel to power the nationÃ¢â‚¬â„¢s growing energy needs. It has also ventured into the global market by establishing various business ventures in 26 countries and is now positioning itself as a multinational oil corporation. Petronas is actively engaged in the exploration, development, and production of crude oil and natural gas, not only in Malaysia but other countries as well. In Malaysia, these activities are undertaken and managed through Production Sharing contracts (PSC) with a number of international oil and gas companies. 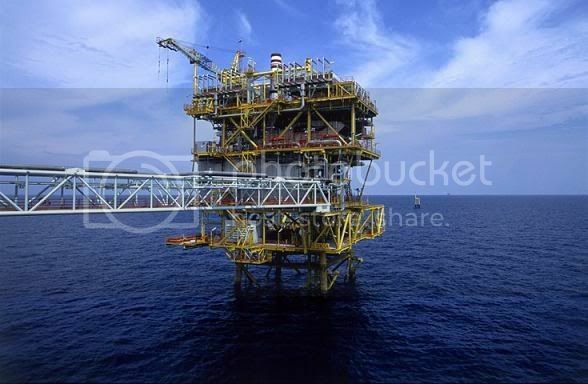 Currently Malaysia has about 45 oil fields in production and several others under development. These oilfields produce high quality blends of crude. Out of 218 gas fields discovered in Malaysia, around 15 are already in production with several more under development. Malaysia is currently the worldÃ¢â‚¬â„¢s third largest liquefied natural gas (LNG) supplier and producer, after Indonesia and Algeria. The Petronas Bintulu LNG complex houses the MLNG, MLNG 2 and MLNG 3 plants. The three plantsÃ¢â‚¬â„¢ combined capacity of 23 million tons apa year, together with ancillary facilities which include six LNG storage tanks and two loading jetties, make the Bintulu LNG complex the worldÃ¢â‚¬â„¢s largest LNG production facility in a single location. In 2002, Malaysia earned US$3.26 billion from the export of LNG, which amounted to 5.6 percent of the countryÃ¢â‚¬â„¢s GDP. Japan, South Korea, and Taiwan are the principal buyers of LNG from Malaysia. MalaysiaÃ¢â‚¬â„¢s share of the Japanese LNG market is 25 percent; 49 percent of the Taiwanese; and 21 percent of South Korea's. PetronasÃ¢â‚¬â„¢ total investment in its LNG business over the last 20 years (including upstream gas production facilities, downstream gas liquefaction facilities, and LNG transport and port facilities) amounted to US$9.87 billion. Oil and gas exploration and downstream facilities account for about 60% of U.S. investment in Malaysia. Total U.S. investment in the oil and gas sector, downstream and upstream combined, is estimated at US$8.0 billion. Exxon Mobil CorporationÃ¢â‚¬â„¢s subsidiary, ExxonMobil Exploration and Production Malaysia Inc., is the largest oil producer in Malaysia and the largest supplier of gas to Peninsular Malaysia, producing approximately 280,000 barrels of oil and 1.4 billion cubic feet of gas apa day. Shell is the second largest oil and gas producer in Malaysia. Occidental Petroleum Company (Oxy) made a series of major gas and condensate discoveries in East Malaysia in the 1990s but sold its rights to Shell a few years ago. Triton (U.S.) and its partners have made some successful hydrocarbon discoveries in the Malaysia-Thailand Joint Development Area in the South China Sea. In 1998, Petronas signed production sharing contracts with U.S.'s Amerada Hess to explore two offshore blocks in Malaysia. 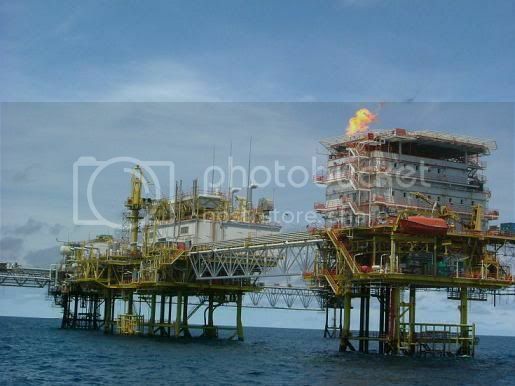 In 2002, five new oil fields and three new gas fields began operating in Malaysia. In addition, 94 development wells were drilled and 60 worked-over during the year, while 246,475 line kilometers of seismic data were acquired for exploration and developmental purposes. Three new PSCs were signed in 2002 as efforts continue to increase the nationÃ¢â‚¬â„¢s oil and gas production capacity and reserves. Malaysia is expected to maintain its current oil production level of 600,000 barrels apa day (bpd) during 2001-2005. In 2002, crude oil production was 597,000 bpd, close to the production target of 600,000 bpd set for the year under the National Depletion Policy. With an additional 103,000 bpd from condensing, national oil production reached 700,000 bpd in 2002. The production of natural gas for 2002 was 1,708,200 million standard cubic feet. Malaysia remains committed to completing the US$800 million Thai-Malaysia Gas Pipeline project--a 50-50 joint venture between Petronas and Petroleum Authority of Thailand. The joint venture will build, own, and operate a gas pipeline and a gas separation plant. 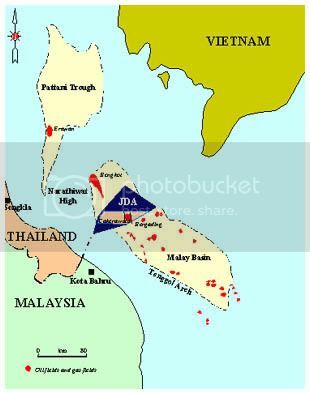 The proposed project is to supply gas from Southern Thailand to Peninsular Malaysia from a 7,520 square km offshore oil exploration area called the Malaysia-Thailand Joint Development Area (JDA). The JDA is ready to come on-stream in mid 2002. However, the first gas from this field will be delayed due to delays in the construction of the proposed gas separation plant and transmission pipeline. To date, exploration and appraisal activities in the JDA have found 15 gas fields with estimated reserves of about 9 tcf. Upstream investment at the JDA will continue to be carried out in the next three to four years to develop the upstream resources and related downstream infrastructure by Petronas Carigali, Triton Oil company, and PTTEP International Ltd., the three main operators. Memorandum of Understanding (MOU) was singed in 1979 between the two Government on the establishment of a Joint Authority for the exploration and exploitation of the resources of the seabed in a defined area of the overlapping claims of continental shelf of the two countries in the Gulf of Thailand for a period of 50 years. What is JDA (Joint Development Area)? Area of overlapping continental shelf claimed by both Malaysia and Thailand with approximately 7,250 square kilometers in size, located in the lower part of the Gulf of Thailand near the South China Sea. Area agreed by the two Governments in 1979 to be jointly explored and exploited for non-living natural resources for the mutual and equal benefits of the two countries. 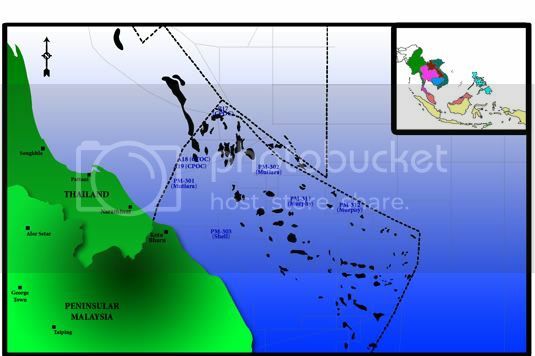 Area to be supervised and administered by the Malaysia-Thailand Joint Authority (MTJA) in respect of petroleum exploration and production under the Malaysia-Thailand Joint Authority Act 1990/B.E.2533. Sekadar memetik isu panas ketike ini, dari laman Tranungkite. Di perairan Kelantan terdapat simpanan GAS ASLI sebanyak 13 trillion kaki persegi yang sudah sedia untuk diterokai.(13,000,000,000,000). Ia cukup untuk 7 generasi rakyat Kelantan. (lebih kurang 500 tahun lamanya). Rakyat Kelantan menerusi kerajaan pimpinan Tuan Guru menuntuk hak Pendaratan GAS ASLI itu di buat di pantai Kelantan dan menuntut royalti GAS ASLI yang menjadi hasil bumi rakyat Kelantan di bayar kepada Rakyat Kelantan. Petronas mengesahkan bahawa operasi GAS ASLI di BLOK A 18 sudah bermula menerusi Syarikat Carigali HESS. Petronas memegang 50% saham di dalam syarikat tersebut menerusi Petronas Carigali Sdn Bhd dan 50% lagi dipegang oleh Aremada Hess Inc.
Sekarang ini, operasinya mengeluarkan 6,000 tong GAS ASLI sehari. Jarak Blok A18 adalah lebih dekat ke Kota Bharu daripada di hantar ke Kerteh dan Songkla. Kerajaan BN bagaimanapun memilih pendaratan GAS ASLI itu dibuat di Songkla walaupun kosnya lebih tinggi akibat jarak yang jauh itu. Dalam usaha mempertahankan hak rakyat Kelantan dan memperkasakan hasil bumi Kelantan untuk rakyat Kelantan, Kerajaan Kelantan pimpinan PAS telah meluluskan pembinaan Terminal Pendaratan Gas Asli dan juga Supply Base untuk Petroleum. Menerusi penerokaan GAS ASLI di Blok A 18, setiap hari, Petronas sepatutnya membayar rakyat Kelantan royalti yang bernilai RM512,000.00 (RM512 ribu) sehari dan ini bererti Kerajaan Kelantan seharusnya mendapat pendapatan tambahan dari royalti GAS ASLI yang bernilai RM186,880,000 (RM186 juta) setahun. Menerusi hasil terbaharu ini, PAS Kelantan sudah berjanji untuk memberi subsidi gas memasak sebanyak RM3.00 se tong bagi rakyat Kelantan. PAS Kelantan juga akan menggunakan hasil pendapatan baru itu untuk tujuan kebajikan dan mempertingkatkan taraf hidup rakyat Kelantan serta membasmi kemiskinan. Blok B 17 dan C 19 Ã¢â‚¬â€œ Operasi bermula suku ke tiga 2009. Sebab itulah BN berusaha sangat merampas semula Kelantan kerana tidak mahu royalti GAS ASLI ini digunakan oleh Kerajaan PAS membangunkan Kelantan sehingga mengakibatkan Kelantan semakin pesat membangun dan membuat mustahil bagi BN untuk merampas Kelantan semula. Apabila semua telaga-telaga GAS ASLI ini beroperasi Royalti GAS ASLI yang akan diterima rakyat Kelantan ialah bernilai RM1,000,000,000 (RM1 Billion). Sebab itulah BN mahu perampas Kelantan sebelum telaga-telaga GAS ASLI ini mula beroperasi. PAS komited dan akan memperjuangkan habis-habisan bersama rakyat Kelantan untuk mendapatkan royalti GAS ASLI ini. Jika BN merampas Kelantan, royalti GAS ASLI tidak akan menjadi milik rakyat Kelantan dan rakyat Kelantan akan menerima nasib yang sama seperti Terengganu. Terengganu menikmati royalti minyak dan GAS ASLI sebanyak RM1.2 billion setahun di dalam bentuk wang ehsan. Wang Ehsan tidak diberi kepada kerajaan Terengganu tetapi disalurkan kepada orang tertentu seperti Patrick Lim untuk digunakan untuk projek seperti Monsoon Cup dan Pembinaan Taman Islam Hadhari yang tidak mendatangkan hasil terus kepada rakyat Terengganu. Jika BN memerintah, rakyat akan terus hidup dibelenggu kemiskinan dan ekonomi negeri akan semakin teruk seperti di Terengganu. Walaupun menerima RM1.2 billion setahun, rakyat Terengganu lebih miskin dari rakyat Kelantan. Hutang tertunggak Terengganu, lebih RM300 juta sedangkan hutang tertunggak Kelantan semenjak pemerintahan PAS hanya tinggal kurang RM12 juta. Tu pasal BN tergila-gilakan Kelantan..
LUMUT, March 18 (Bernama) -- Oil and gas player, Kencana Petroleum Bhd expects its marine engineering business, which includes rig fabrication, vessel operation and charter activities to contribute 20 percent to the group's turnover by 2011, its executive chairman, Datuk Mokhzani Mahathir said today. 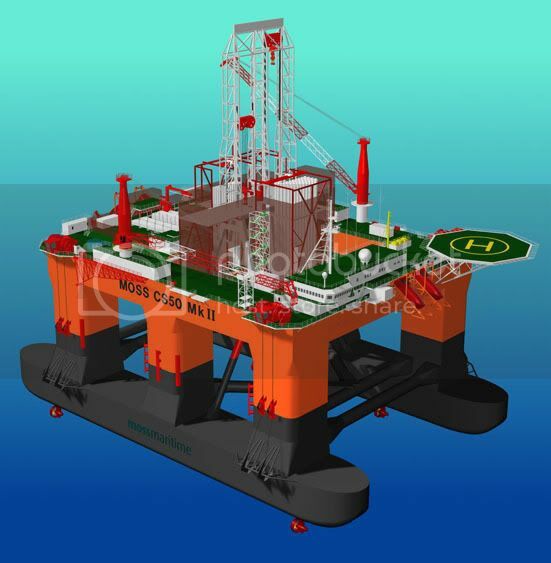 Other works in the segment include refurbishment and conversion of rigs and it is also expected to carry out drilling works and repair and maintenance in the near future. Contribution from the marine side in the long term will hopefully also come from the charter of the tender-assisted drilling rig, he said. "That will stabilise our income," he told reporters after handing over the Maari wellhead platform it co-built to OMV New Zealand Ltd. 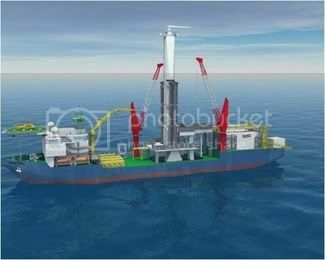 The tender-assisted rig, known as the Kencana Mermaid-1 is being built by the group's unit Kencana HL. Mokhzani said to beef up the marine business, the group would be sourcing for support vessels over the longer term. "We are looking at other small vessels like tug boats to assist in marine operations, costing around US$10 million," he said. He said the group has identified a few clients for the chartering of the rig. "We need to get clients to ensure it goes to work as soon as it leaves here. We have identified a few clients but have not inked anything yet," he said. Kencana Petroleum is also ready to kick up its drilling works, but he said that would "come hand in hand with the tender rig which rolls out end of next year". Going forward, he said the group planned to grow its business by entering smart partnerships as it was difficult to find assets and expert manpower. "This is how we are going to build our businesses," he said. sebagai student gas, info2 yang diberikn oleh daeng _jati sangat-sangat berguna..thanks a lot..
apa yang saya nampak, ini membuka peluang pekerjaan yang baik especially those dalam filed oil and gas engineering... no wonder lah .a senior2 yang dapat kerja kat belah2 sana..huhuhuu..
Huda Haida nak pergi Offshore ye? kroje kat sana 12 jam sehari. kat sana letih rasa lebih lagi sebab tengah laut. kawan teman seurang wanite mabuk laut. dia duduk kat offshore sekadar duduk kat LQ (Living Quaters) saja sebab tak terdaye nak berjalan. rasulullah pernah mengambil balik tanah yang dikurniakan kepada bilal kerana mendapati ada hasil galiam yang banyak ditanah tersebut. sekadar membayar royalti tidak menepati kehendak syara'. dalam kitab al amwal qadhi abu yusof dan syeikh abdul rahman maliki menjelaskan hasil bumi yang tidak terbatas adalah hak milik ummat yang negara hanya berfungsi sebagai pengelola. hasilnya perlu dikembalikan kepada ummat bergantung ijtihad khalifah. memberikan konsesi minyak kepada syarikat2 hatta syarikat orang islam sekalipun seperti PERTAMINA, PETRONAS, SAUDI ARAMCO adalah perompakan hak milik ummat islam apatah lagi kalau di'sedekah'kan kepada syarikat orang kapir seperti EXXON, HALLIBURTON, BP, SHELL dll. yang saya jelaskan keharamannya adalah pengagihan konsesinya kepad syarikat2 tersebut. bekerja dengannya adalah mubah selagi kerja yang dilakukan adalah mubah. 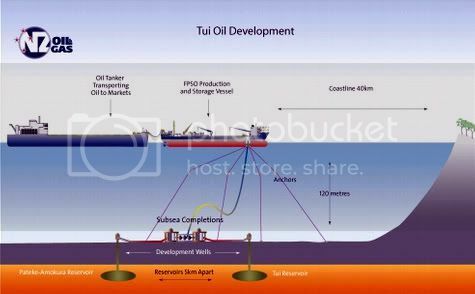 The FPSO, which has been designed to cater to different types of offtake oil tankers, will handle 120,000 barrels of oil apa day. Dengan adanye FPSO, penjimatan kos dan masa boleh diminimakan kerana FPSO boleh melakukan kerja-kerja penyimpanan sementara, pemprosesan dan pemindahan tanpa perlu bawa ke pusat pemprosesan di pantai (onshore). Minyak dan gas boleh dipindahkan ke Tanker yang lain untuk proses penjualan malah boleh jual beli di tengah laut. yup Daeng_Jati..tu memang dah cita-cita saya nak ke offshore..tiap kali ayah balik kerja cerita pasal engineer2 yang muda2 trun offshore memang rasa tercabar...insya allah, ada rezeki ada lah..
Baguslah Huda, bagus cita-cita tu, insyaAllahuta'ala meke akan dapat. 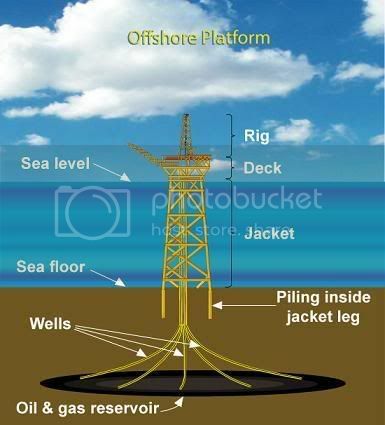 An oil platform is a large structure used to house workers and machinery needed to drill and then produce oil and natural gas in the ocean. Depending on the circumstances, the platform may be attached to the ocean floor, consist of an artificial island, or be floating. Generally, oil platforms are located on the continental shelf though as technology improves, drilling and production in ever deeper waters becomes both feasible and profitable. A typical platform may have around thirty wellheads located on the platform and directional drilling allows reservoirs to be accessed at both different depths and at remote positions up to 5 miles (8 kilometres) from the platform. 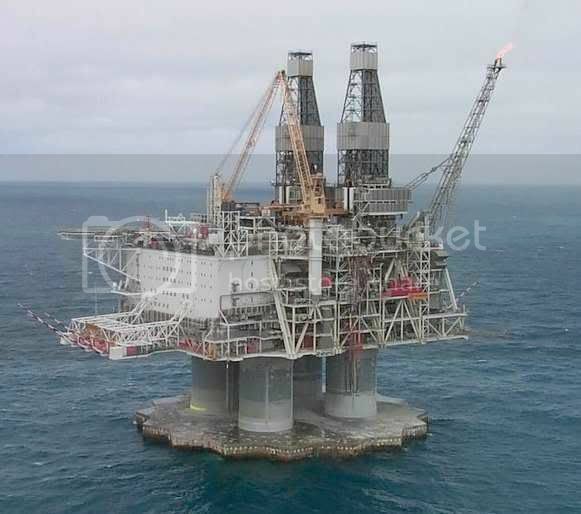 Fixed Platforms, built on concrete and/or steel legs anchored directly onto the seabed, supporting a deck with space for drilling rigs, production facilities and crew quarters. Such platforms are, by virtue of their immobility, designed for very long term use (for instance the Hibernia platform). Various types of structure are used, steel jacket, concrete caisson, floating steel and even floating concrete. 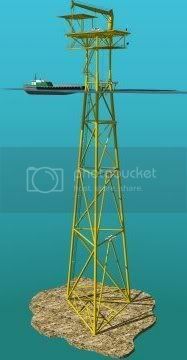 Steel jackets are vertical sections made of tubular steel members, and are usually piled into the seabed. Concrete caisson structures, pioneered by the Condeep concept, often have in-built oil storage in tanks below the sea surface and these tanks were often used as a flotation capability, allowing them to be built close to shore (Norwegian fjords and Scottish firths are popular because they are sheltered and deep enough) and then floated to their final position where they are sunk to the seabed. 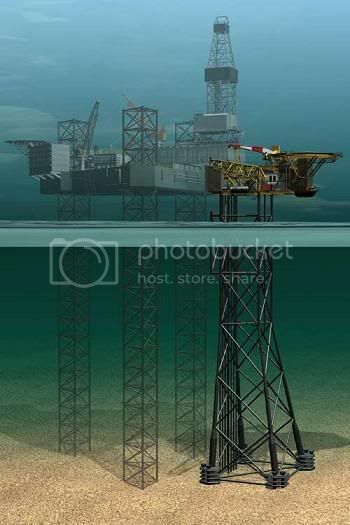 Fixed platforms are economically feasible for installation in water depths up to about 1,700 feet (520 m). Compliant Towers, consist of narrow, flexible towers and a piled foundation supporting a conventional deck for drilling and production operations. 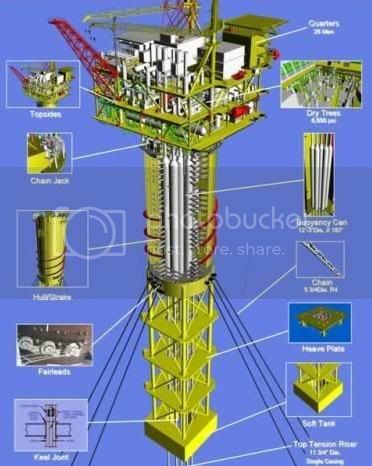 Compliant towers are designed to sustain significant lateral deflections and forces, and are typically used in water depths ranging from 1,500 and 3,000 feet (450 and 900 m). Semi-submersible Platforms having legs of sufficient buoyancy to cause the structure to float, but of weight sufficient to keep the structure upright. Semi-submersible rigs can be moved from place to place; and can be lowered into or raised by altering the amount of flooding in buoyancy tanks; they are generally anchored by cable anchors during drilling operations, though they can also be kept in place by the use of steerable thrusters. Semi-submersible can be used in depths from 600 to 6,000 feet (180 to 1,800 m). Jack-up Platforms, as the name suggests, are platforms that can be jacked up above the sea, by dint of legs than can be lowered like jacks. These platforms, used in relatively low depths, are designed to move from place to place, and then anchor themselves by deploying the jack-like legs. 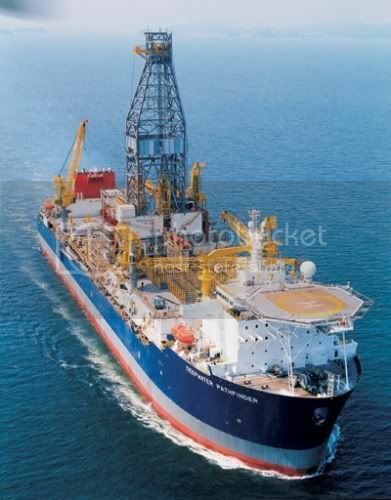 Drillships, a maritime vessel that has been fitted with drilling apparatus. It is most often used for exploratory drilling of new oil or gas wells in deep water but can also be used for scientific drilling. It is often built on a modified tanker hull and outfitted with a dynamic positioning system to maintain its position over the well. Floating production systems are large ships equipped with processing facilities and moored to a location for a long period. 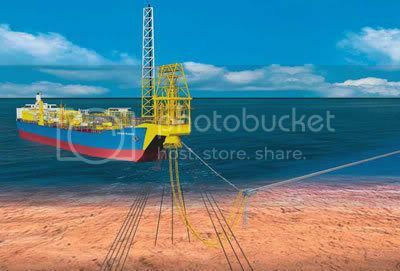 The main types of floating production systems are FPSO (floating production, storage, and offloading system), FSO (floating storage and offloading system), and FSU (floating storage unit). 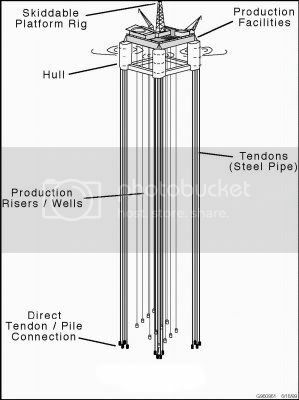 Tension-leg Platforms, consist of floating rigs tethered to the seabed in a manner that eliminates most vertical movement of the structure. TLPS are used in water depths up to about 6,000 feet (2,000 m). Spar Platforms, moored to the seabed like the TLP, but whereas the TLP has vertical tension tethers the Spar has more conventional mooring lines. Spars have been designed in three configurations: the "conventional" one-piece cylindrical hull, the "truss spar" where the midsection is composed of truss elements connecting the upper buoyant hull (called a hard tank) with the bottom soft tank containing permanent ballast, and the "cell spar" which is built from multiple vertical cylinders. The Spar may be more economical to build for small and medium sized rigs than the TLP, and has more inherent stability than a TLP since it has a large counterweight at the bottom and does not depend on the mooring to hold it upright. 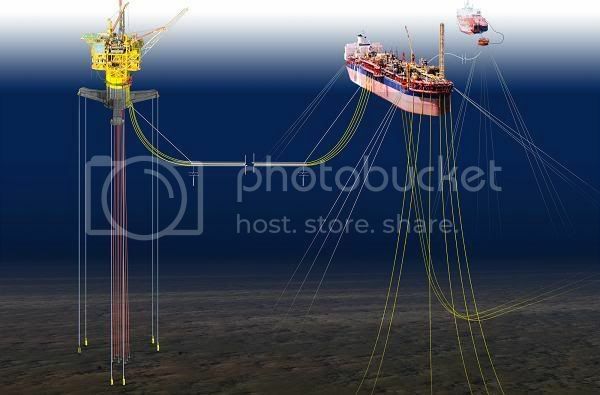 It also has the ability, by use of chain-jacks attached to the risers, to move horizontally over the oil field. The first Spar was Kerr-McGee's Neptune, which is a floating production facility anchored in 1,930 feet (588 m) in the Gulf of Mexico. 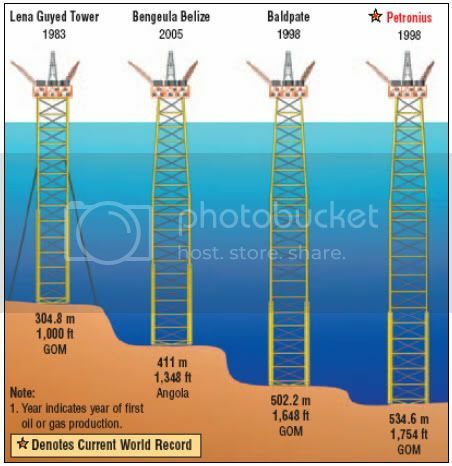 Dominion Oil's Devil's Tower is located in 5,610 feet (1,710 m) of water, in the Gulf of Mexico, and is the world's deepest spar. The first (and only) cell spar is Kerr-McGee's Red Hawk. Erb-West Complex one the pioneering Oil and Gas Facility at Offshore Sabah, Malaysia. wah dENG jati ni engineer oil and gas ke??? sekarg kat platform mana?? ?mana tahu kita boleh jumpa kat ofshore.. In August 2004, the Adriatic IV was on location over the Temsah gas production platform, off Port Said, Egypt in the Mediterranean. The rig was drilling a natural gas well when a gas blowout occurred during drilling ops. Reports state that there was an explosion followed by fire which was initially contained on the jack-up. 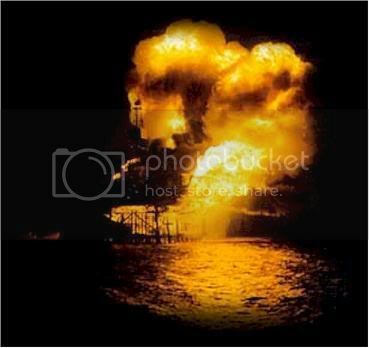 For reasons unknown, the fire then spread to the Petrobel-run platform where it continued to rage for over a week before being brought under control. 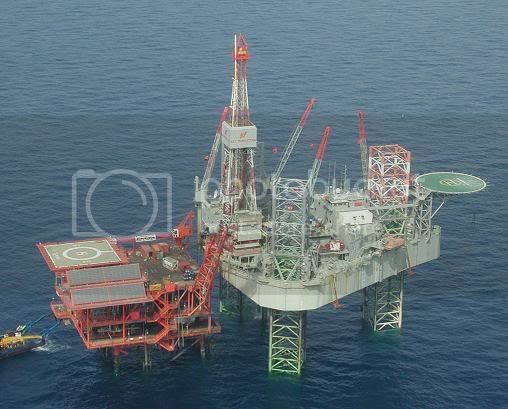 More than 150 workers on the jack-up and platform were evacuated with no casualties, due in part to the prior recommendation that production activities be ceased as a precautionary measure. ye Kencana HL tu buat Maari Project. Teman terlibat dengan projek tu. 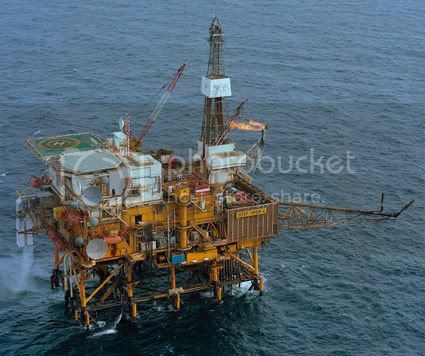 The Piper Field was discovered by Occidental in January 1973, with the Piper Alpha platform becoming operational in 1976. 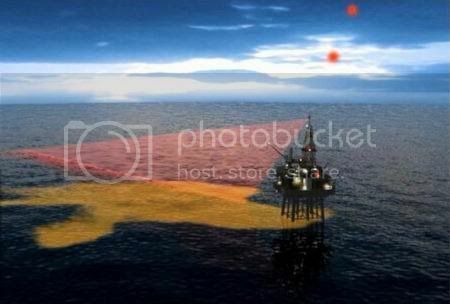 Located about 120 miles north-east of Aberdeen, the platform initally produced crude oil. In late 1980, gas conversion equipment was installed allowing the facility to produce gas as well as oil. A sub-sea pipeline, shared with the Claymore platform, connected Piper Alpha to the Flotta oil terminal on the Orkney Islands. Piper Alpha also had gas pipelines connecting it to both the Tartan platform and to the separate MCP-O1 gas processing platform. In total, Piper Alpha had four main transport risers: an oil export riser, the Claymore gas riser, the Tartan gas riser and the MCP-01 gas riser. On 06 July 1988, work began on one of two condensate-injection pumps, designated A and B, which were used to compress gas on the platform prior to transport of the gas to Flotta. A pressure safety valve was removed from compressor A for recalibration and re-certification and two blind flanges were fitted onto the open pipework. The dayshift crew then finished for the day. During the evening of 06 July, pump B tripped and the nightshift crew decided that pump A should be brought back into service. 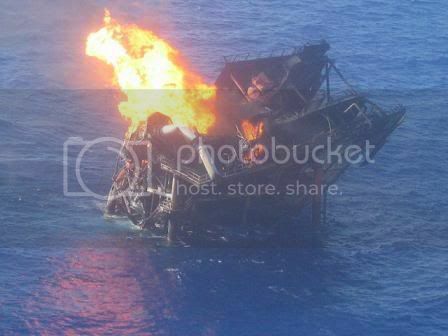 Once the pump was operational, gas condensate leaked from the two blind flanges and, at around 2200 hours, the gas ignited and exploded, causing fires and damage to other areas with the further release of gas and oil. Some twenty minutes later, the Tartan gas riser failed and a second major explosion occurred followed by widespread fire. Fifty minutes later, at around 2250 hours, the MCP-01 gas riser failed resulting in a third major explosion. Further explosions then ensued, followed by the eventual structural collapse of a significant proportion of the installation. 167 main died as a result of the explosions and fire on board the Piper Alpha, including two operators of a Fast Rescue Craft. 62 main survived, mostly by jumping into the sea from the high decks of the platform. Between 1988 and 1990, the two-part Cullen Inquiry established the causes of the tragedy and made recommendations for future safety regimes offshore. 106 recommendations were made which were subsequently accepted and implemented by the offshore operators. the continued pumping of gas and oil by the Tartan and Claymore platforms, which was not shut down due to a perceived lack of authority, even though personnel could see the Piper burning. banyak sungguh maklumat yang ana dapat di sini. Thanks Daeng_Jati. salam abang Daeng_Jati...next year saya start practikal...plannya nak p offshore.safety course saya dah ambil dah...so nak tanya abang,ada tak company yang ambil budak practikal ni..boleh tak bagi alamat..boleh try apply nanti..
kalau nak praktikal kat darat boleh. Hundreds of offshore structures are operating within sensitive marine areas and it is doubtful whether oil spills are correctly reported. This has been evident on several occasions, where airplanes equipped with airborne surveillance equipment have observed an offshore structure at the time of a significant discharge of oil. 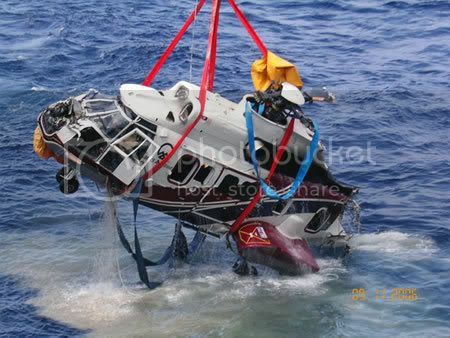 The differences between the amount measured by the airplane and the amount reported from the offshore structure often results in cleanup actions being based on incorrect or non-objective information, which is reflected in the inefficient actions taken. This problem is addressed by the OSIS sensor system providing 24hours a-day surveillance against oil spills. The sensor system will identify and track oil spills from offshore structures and calculate the spill volume with accuracy of 90 percent. The appllication is illustrated above. The sensor system is available as a manual or automated system. The manual system provide the onsite user with a tool to monitor, track and quantify an emission of oil. This is especially useful for self monitoring and control during tanker loadings and other operations where oil spills are a potential risk. The automated system enables onshore users to be continuously updated with sensor measurements from any offshore location. In case of an oil spill, the estimated contamination area and spill volume is automatically reported to the onshore user. Target groups have access to info screens via a traditional web interface to the OSIS Central Server. salam..thank abang daeng...so kalau ikutkn saya memang tak ada pengalaman lagi nak p offshore...base on your experience lah,apa yang akan abang daeng buat kalau duduk d tempat saya?minat 2 memang minat lah..lagi pun saya ambil chemical eng..so part mana yang saya boleh masuk dan step mana yang boleh saya mulankan dulu..hope abang boleh bagi pandangan...terima kasih..
Untuk menjawab soalan Bahrin, teman berikan dulu gambaran keseluruhan Industri Minyak dan Gas. Selepas mengetahuinye kita akan tahu di mana kita berada dan minat bidang minyak dan gas yang mana satu. Ni kroje urang duduk makmal buat kajian demi kajian tentang potensi minyak dan gas yang hendak dihasilkan. Minyak dan gas ni ada pelbagei jenis dan warna yang digunekan dengan pelbagei aktiviti. Kroje dia tu saja lah, targetnye untuk menghasilkan minyak dan gas yang berkualiti dan baru. Kroje bidang ni tak duduk rumah, asyik berjalan saja. Bidang ni bidang industri berat. kat Malaysia ada beberape syarikat fabrikasi minyak dan gas ni, antaranye MMHE, RFSB, SDE dan pelbagei lagi. Bidang ni banyak pada menghasilkan minyak dan gas. juga proses pemasaran. macam Petronas Dagangan. Nah, sekarang Bahrin dapat tau di mana minat Bahrin berada. Teman rasa Bahrin berada dalam Research&Development ataupun bidang produksi. Tapi sekiranye Bahrin suka merantau dan suka aktiviti lasak, boleh lah masuk bidang Eksplorasi dan Carigali. Bahrin boleh merantau dari tengah laut hinggalah ke kawasan bersalji. Krojenye mudah, setelah kumpulan Pencarigali dan eksplorasi menjumpai sumber minyak dan gas, mereka akan ambil sampel dulu untuk diujikaji sebelum proses seterusnya iaitu menyedut minyak ataupun gas. Proses ujikaji minyak dan gas tu lah yang akan dilaksanakan oleh Ahli kimia minyak dan gas seperti bahrin. Bermakne Bahrin adalah salah seorang ahli kumpulan Eksplorasi dan carigali tapi pengkhususan dalam Ujikaji. 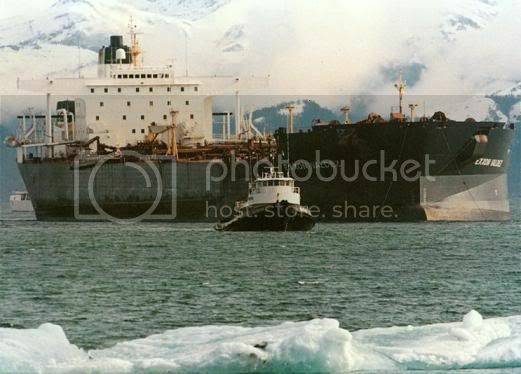 Exxon Valdez was the original name (later Sea River Mediterranean and eventually Mediterranean) of an oil tanker owned by the former Exxon Corporation. 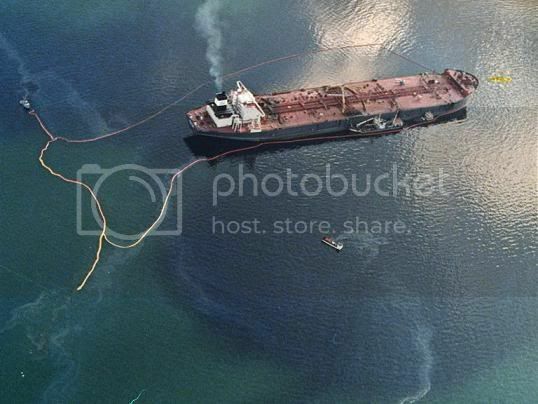 It gained widespread infamy after the March 24, 1989 oil spill in which the tanker, bound for Washington, USA, captained by Joseph Hazelwood, hit Prince William Sound's Bligh Reef and spilled an estimated 11 million gallons (42 megalitres) of crude oil. This has been recorded as one of the largest spills in U.S. history and one of the largest ecological disasters. The vessel had an all steel construction, built by National Steel and Shipbuilding Company in San Diego. A relatively new tanker at the time of the spill, it was delivered to Exxon in December 1986. The tanker was 300 m long, 50 m wide, and 27 m in depth (987 ft by 166 ft by 88 ft), weighing 30,000 tons empty and powered by a 31,650 shp (23.60 MW) diesel engine. The ship could transport a maximum of 1.48 million barrels (200,000 t) at a sustained speed of 16.25 knots (30 km/h) and was employed to transport crude oil from the Alyeska consortium's pipeline terminal in Valdez, Alaska, to the lower 48 states of the United States. The vessel was carrying about 1.26 million barrels, or about 53 million gallons (200 megalitres), of oil at the time it ran aground. 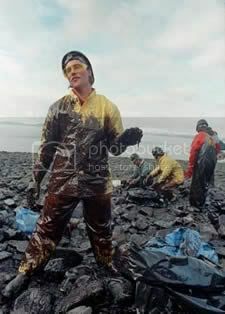 After the spill, the Exxon Valdez was towed to San Diego, arriving on July 10 and repairs began onboard on June 30, 1989. Approximately 1,600 tons of steel were removed and replaced in the month of July 1989, totaling $30 million of repairs to the tanker. After being repaired, the Valdez was renamed the "Sea River Mediterranean," later shortened to "S/ Mediterranean," then to simply "Mediterranean" and sailed under the Marshall Island flag. Although Exxon tried to return the ship to its Alaskan fleet, it was prohibited by law from entering Prince William Sound. teman kroje biasa saja, HSE Engineer saja. In 1989, Exxon Corp. caused one of the worst environmental disasters ever. 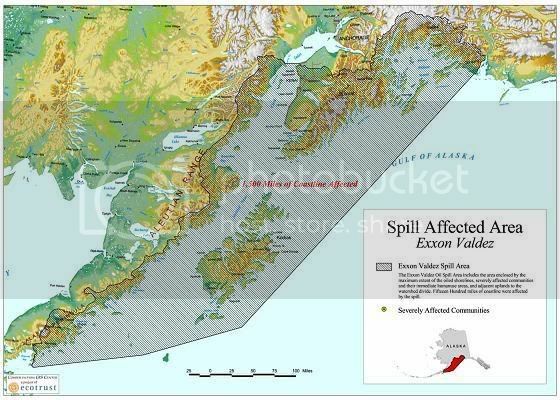 On March 24, the Exxon Valdez oil tanker ran aground, spilling 250,000 barrels, an amount equal to more than 10 million gallons, of oil into Alaska's Prince William Sound. Efforts to contain the spill were slow and Exxon's response was even slower. The incident would go down in crisis management history as a textbook case of how not to respond during a crisis, and "by the time the media was finished, the Exxon name was synonymous with environmental catastrophe. apapun,insiden piper alpha tu masuk final exam...hehehee..
off topic Asif...nak kisahkan jurutera Gas Asli missing di hutan Nenggiri. Jika kita bergerak dari Gua Musang menuju ke Kota Bharu sungai Nenggiri di sebelah kanan adalah Sungai Nenggiri. hanya nak jejak Muhammad Ihsan Haji Ishak jurutera gas Asli Petronas yang missing di sungai Nenggiri. Saya dapat Info sahabatnya kelahiran Negeri Perak sedang berusaha menjejak sahabat yang hilang ini. kira coursemate masa di UTM. daeng jati tak ingainkah mencarai Muhammad Ihsan yang missing in action ini.. Better dapatkan info dengan Ustaz Zaharuddin Abdul Rahman UZAR dalam hal muamalat Islam ini. meke ni team shutdown Cakerawala ke? berapa hari? abang saifuddin, proses penghasilan gas dah dibuat dah melalui Platform Cakerawala. Lepas tu teman terlibat dengan proses fabrikasi Platform BUMI (BMA), Bulan (BLA) dan SURYA (S.yang.A). ketiga2 platform tu dah berada di lautan luas. Pengalaman teman menyelusuri Sungai Neggiri biasa saja. cuma reakriasi dengan kawan-kawan. Sambil reakriasi mengimbau ke zaman dulu yang pendekar2 Kelantan dan Terengganu yang berakit disini. kat kawasan Sungai neggiri ni ada satu gua tempat tinggal Pak Belang. Tapi teman tak berpeluang terserempak dengannye. tak bertauliah dan berkuderat nak menjejak Muhammad Ihsan ni. HESS adalah syarikat milik Amerika Syarikat. Mother Platform belah kanan tu CKR kan? yang tengah tu C.K.P dan yang last tu CKA? betuikan teman kalau silap ye Pejuang terakhir. salam..abang perjuang terakhir..abang kerja dengan company apa?best tak? apa yang dikatakan oleh pejuang terakhir tu betul. Tapi benda ni tak boleh elak. Minyak boleh disedut melalui dasar tanah. tapi tak berapa efektif. Kita ada undang-undang laut. 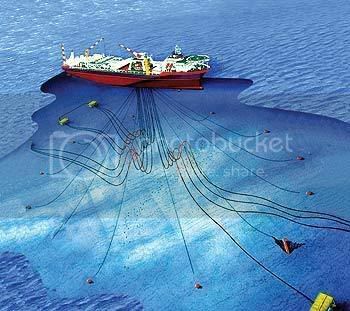 contohnya undang-undang International Sea-Bed Agreement, Working Conditions Decree 1997, Safety on Offshore Installation Executive Order 711, Offshore Installation (PFEER) Regulations 1995 banyak lagi undang-undang yang mengawal kerja-kerja ditengah laut ni. Setiap laut kat dunia ni ada undang2nya tersendiri, berdasarkan undang-undang negara berkenaan dan juga antarabangsa. Jadi sesiapa pandai main manipulasi dia akan untung, contohnya Amerika dah melumpuhkan Iraq, sumber aslinye disedut dan digunakan oleh Amerika. kalau di Malaysia, antara undang2nya ialah: PETROLEUM (SAFETY MEASURES) ACT 1984 tapi yang ni just basic dan kegunaan dalam negara sahaja. erm...company abang sendiri ini pun mula bulan 5 sampai bulan 10 ini ada shutdown kat offshore....minor dan major agaknya.ada task yang tak sempat buat tahun lepas dia carry forward tahun ini..Kalau ada noish untuk kerja dalam plant kat paka lah...safety pasport ada? salam abang...safety pasport 2 yang nak p offshore kan?kalau yang 2 tak ada lagi lah..plantnya nak buta ujung taun ni sebab next year dah start nak buat practikal...kalau ada niosh 2 ada project tak kat paka?nak join,boleh juga cari pengalaman dulu..
Ni contoh2 Kursus untuk Keperluan Kerja Luar Pantai (offshore). Kursus2 yang ditawarkan samaada kursus Asas dan juga kursus berterusan. Keperluan 'Offshore' Tropika berbeza dengan Keperluan 'Offshore' North Sea. 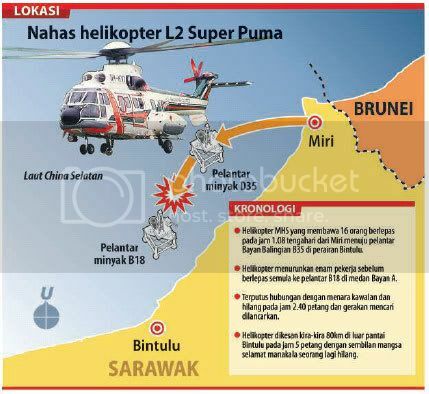 KUCHING: Sebuah helikopter terhempas di perairan Laut China Selatan, kira-kira 80 kilometer (km) di luar pantai Bintulu semalam menyebabkan seorang pekerja pelantar minyak hilang.Bagaimanapun, sembilan lagi termasuk krew pesawat L2 Super Puma milik Malaysian Helicopter Services (MHS) itu, terselamat. Mangsa yang hilang, dikenali Irwan Saslas Aini Salihin, 26, juruteknik D-Tech Sdn Bhd, dipercayai tenggelam bersama bangkai pesawat itu. Pengarah Wilayah Jabatan Penerbangan Sarawak, Huang Tiong Poh. berkata pihaknya menerima laporan pesawat itu terputus hubungan dengan menara kawalan dan hilang pada kira-kira jam 2.40 petang. Helikopter itu, yang bertolak dari Lapangan Terbang Miri, kira-kira jam 1.08 tengah hari menuju ke pelantar minyak di perairan Bintulu, mulanya membawa 16 penumpang termasuk dua krew. Ia selamat mendarat di pelantar minyak Bayan Balingian D35 dan menurunkan enam pekerja sebelum berlepas semula ke pelantar B18 di medan Bayan A untuk penghantaran seterusnya. Bagaimanapun, pesawat berkenaan dilaporkan hilang kira-kira jam 2.40 petang. Berikutan itu, gerakan mencari dan menyelamat dilakukan menggunakan helikopter milik MHS dan Shell Bhd yang berpangkalan di Miri. Huang berkata, helikopter berkenaan dikesan pasukan mencari dan menyelamat, kira-kira jam 5 petang. Petronas pula dalam kenyataannya berkata, sehingga petang semalam operasi mencari dan menyelamat mangsa yang hilang masih diteruskan. Syarikat itu menjelaskan, pesawat dengan lapan penumpang dan dua juruterbang itu terhempas kira-kira 80 km di luar pantai Bintulu, kira-kira jam 2.30 petang, tidak lama selepas bertolak dari sebuah pelantar minyak menuju sebuah lagi pelantar. Enam daripada penumpang pesawat itu ialah kakitangan Petronas Carigali Sdn Bhd, manakala dua lagi bekerja dengan kontraktor yang dilantik syarikat itu. Sementara itu, di Terminal MHS di Lapangan Terbang Miri, keluarga mangsa berkerumun untuk mendapatkan maklumat mengenai kejadian itu tetapi tidak dibenarkan masuk. Ramai yang kecewa dan pulang selepas dimaklumkan mangsa yang selamat dihantar ke Hospital Bintulu untuk rawatan. Jabatan Meteorologi Malaysia melaporkan, ketika kejadian keadaan laut di perairan Sarawak bergelora dengan angin kencang bertiup dari arah timur laut selaju 50 hingga 60 km/j dan laut berombak setinggi tiga sehingga 4.5 meter. Tapi kalau nick_sieq, nak join juga boleh saja, tapi dah limited lah bidang yang dicebur. Banyak kroje2 lapangan pula. Meke sesuai menceburi bidang Research and Development. Cipta minyak2 yang baru. satu lagi nak tanya.... kalau untuk EOR developement project, company mana yang selalu buat research??? nick_sieq, maap lah teman tak tahu tentang bidang ni. Mungkin kawan-kawan ada yang tahu boleh tolong jawabkan. ye, teman pun sependapat dengan Nurul Ainun. Mungkin dalam bahagian Eksplorasi dan Carigali. rasanya juga, syarikat 3rd Party juga ada menyediakan teknologi bidang ni. Semua elemen langkah kawalan risiko yang dijelaskan di atas adalah di bawah HSE Risk (Hazard and Effects) Management and Analysis, ataupun mudah dikenali sebagai HEMP. Natural gas is generally regarded as a natural mixture of hydrocarbons found issuing from the ground, or obtained from specially driven wells. Its composition varies across the board (depending on where it is found), but its chief component is "methane", which usually makes up about 80-95 % of the gas. The rest of the gas is made up of varying amounts of other gases like ethane, propane, butane, and a host of hydrocarbons. kalau kat tengah laut, orang panggil minyak dengan name 'HidroKarbon'. jika ada remaja yang ada sijil welding...boleh minta jasa baik adik Daebg jati untuk adjust join the team bertugas di pelantar minyak atau gas asli. Link tersebut semakin menunjukkan akan hal yang Muhammad Ihsan di dalam lindungan Allah. ana ini dhaif jika di compare dengan Muhammad Ihsan yang akhlaknya amat baik...Muhammad Ihsan memang Insan yang baik akhlak. sudah hampir 10 tahun dia di area misteri nusantara tersebut. salam abang daeng dan abang pejuang terakhir..abang berdua shat ke..almer tak dega cerita..bila pula naik pelantar?kepada abang pejuang terakhir,boleh tak bagi email..?senang nak contact kalau dah habis belajar nanti..he..he..salam..
Welder is another profession that becomes the backbone for offshore oil & gas construction works. As far as I know, there is no special 'Certification' required to become a welder. The only thing for sure is you pass the WPQT (Welding Procedure Qualification Test) conducted by CLIENT. Anyway here is some guidelines for those who are willing to become an offshore installation welder. 3 years experience as a fabrication welder. The welding foreman shall work under the direction of the Barge Foreman in charge of executing a task of work. Supervise all welding and marking-off activities. Ensure his crew adhere to established safety rules, codes, practices and requlations in accordance to the procedures. Ensure all his crew have the required tools and safety equipment, and that such items are maintained in a good and safe condtion. Read drawings and specifications, and be familiar with the work programmes to progress the work as necessary for the timely and proper execution of tasks. Report immediately to the Barge Foreman or Barge Superintendent any discrepancies, or material shortage he may discover. Discipline members of his crew if required, and request a change out of unacceptable individuals after liaison with the QA/QC supervisor. The welding foreman shall he an experienced welder of 8 years experience and shall have been enggaged in offshore work in the petroleum industry for a minimum 5 years and have experience of coordinating and supervising welding activities offshore on all offshore platforms, and onboard construction barges for a minimum 2 years. He must have served a recognized apprenticeship as a welder and be qualified to technician level with City and Guilds (or equivalent) qualification. He must have a minimum 5 years experience with at least 5 years in the oil industry and 2 years at a supervisory level. He must be familiar with the international welding codes API 1104, ASME IX and AWS and other related specifications. He must also be familiar with the various grades of steel used in the oil industry and the welding procedures required for the various steels including pre and post heat treatment. In addition he is required to be fully familiar with all pipework fittings and pressure classifications used in the oil industry. He must be a qualified piping and structural welder. In addition he must also be familiar with the hazardous area calssifications and requirement. Sekian serbe sedikit penerangan yang diberikan oleh beliau. teman terpikio satu benda, sesiapa orang 'Iban' Sarawak, anda ada peluang cerah nak kroje kat luar pantai dalam bidang 'Rigging' kerene orang 'Iban' telah dikenali dan diiktiraf oleh orang2 yang bermain dengan 'Offshore' sebagai antara 'Rigger' yang terbaik di dunia. Manakala, bagi anak jadi Terengganu dan Sarawak, ande juga amat berpeluang untuk menceburi bidang Minyak dan Gas ni kerene, negeri kome semua adalah negeri Minyak. Jadi 'main player in oil and gas' macam Petronas, Shell, Exxon Mobil akan mengutamekan anak jati negeri berkenaan, sebagai membalas budi kerajaan negeri yang ada minyak yang banyak. heheheh. Oleh itu, kepade anak jati Negeri Terengganu dan Sarawak, rebut lah peluang ini. Mungkin kalau negeri Kelantan mula mengeluorkan gas aslinye, ramai anak jati Kelantan akan main'join'kan diri dengan bidang ni. RUGILAH MEREKA YANG MEMPERJUANGKAN DEMOKRASI-KUFUR!!!! betul, sistem Khilafah ni memberi hak same dan adil. nak e-mail pejuang terakhir saja ke? erm, kepade semua yang ada e-mail tu, mari lah kongsi2 nanti kita boleh bertukor2 maklumat dan ilmu. kalau teman ada ilmu yang best boleh teman forwardkan kepade semua. dan sesiapa saja yang berkongsi ilmu dan maklumat, marilah nyatakan e-mail masing-masing. kita lebarkan ukhwah dan hubungan. Terima kasih abang Saifuddin kerene berkongsi E-Mail. sesiapa lagi mari lah berkongsi E-Mail sekali. kita berkongsi2 maklumat dan ilmu. The Subsea Asia 2008 exhibition will take place alongside the Subsea Asia Conference held on June 11 2008. It will be open for 2 full days from June 12 2008 to June 13 2008. Subsea Asia will be an ideal fairground for companies to display their products and services direct to conference delegates and other industry professionals. What will you miss if you donâ€™t PRE-REGISTER? Ã˜ Express Registration at specific Pre-Registration counters at the exhibition guaranteeing you an easy and quick access. The keynote address will be delivered by H E Boyd McCleary the British High Commisioner at 9.15am on June 11 2008. By collaborating with the industries leading organisations, the SUBSEA Asia conference will be able to focus on issues that challenge the regionâ€™s Subsea and deepwater professionals. It will bring together the major industry players from around Asia and beyond. p/s: daeng kalau nak tambah maklumat pasal subsea datang lah exibition ini. Many bigger company join this exibition. saya pun nak juga berkongsi ilmu dan info...boleh emel untuk saya sekali?